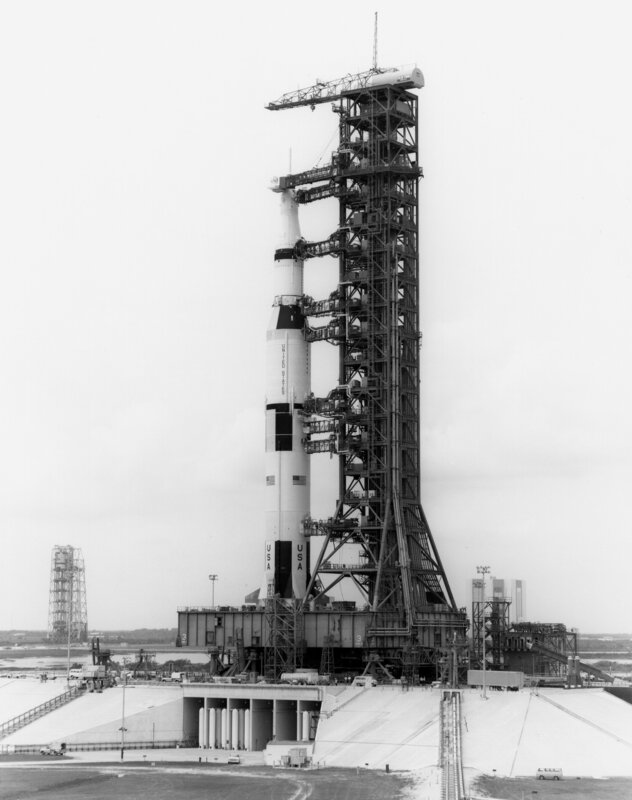 Half a century ago this week, NASA performed the first human test run of the slidewire escape system from the top of the Mobile Launcher at Pad 39A, where Apollo 9 was being prepared for launch in late February. 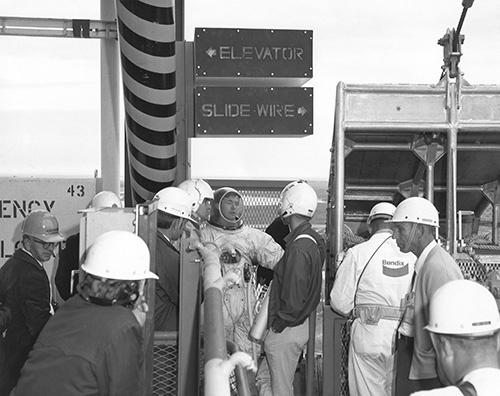 Riding the cab down were NASA Safety Representative Chuck Billings, astronaut Stuart Roosa and Design Engineering Representative Art Porcher along with six full size dummies. That is a superb photo Ed. A rarely seen option of the launch pad. Any closeups of "the crew" on the day Ed? All very good. Brings the training atmosphere to life for us. Amazing photos and what a ride it must have been. Very good set of pictures Ed! Does any cSer know how long the "ride" took from start to motion stop? About 30 seconds, a lifetime if the launch vehicle might explode. Ok with the Shuttle the slide wire system was on the fixed service structure. For Apollo did they have to pull the baskets up and hook the cables up to the tower for each flight of did they drop the cable from the tower and honor to the ground point? 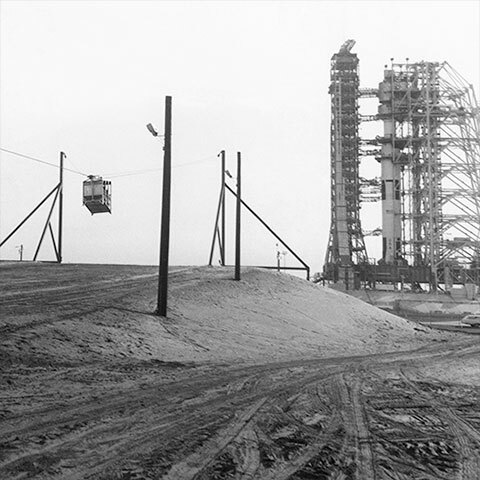 I remember reading that the launch tower overhead crane was used to raise/lower the slide wire. But I cant find a reference for this information. 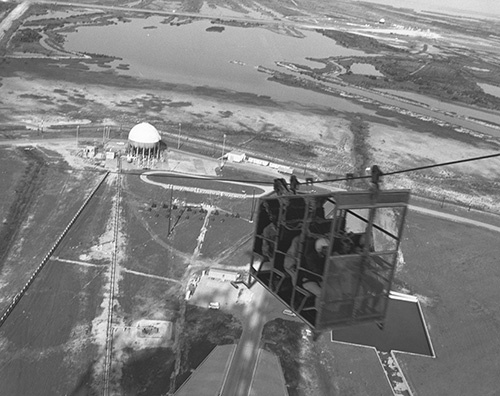 This image shows the area of the launch tower where the slide wire attaches, above the gate in the safety rail, opposite side from the rocket. There is also this document discussing past and future pad escape systems. Oly's document talks about an original Saturn V EES and then a second Saturn V EES that corrected a few items. Any idea when that changeover took place between the two systems? Was this Apollo 9 "first human test run" after the changeover took place? Also how was braking accomplished at end of run? Also how was braking accomplished at end of run? 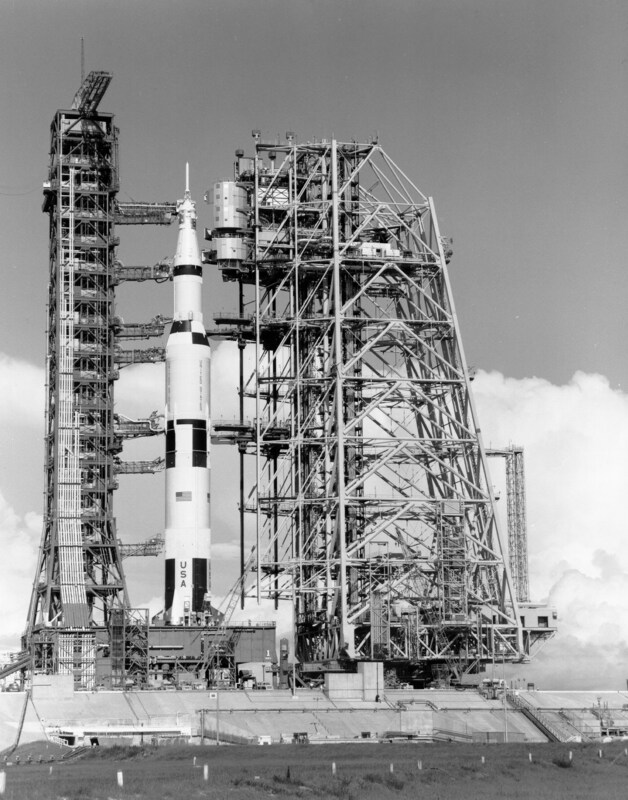 The first EES system was the "rubber room" that required crew to ride the elevator down the tower, details can be found here. A video of the shuttle slide wire braking can be found here. Here is a LIFE photo of a dummy on an earlier Apollo-era slide wire with ML-3 on the pad. That is an interesting photo. 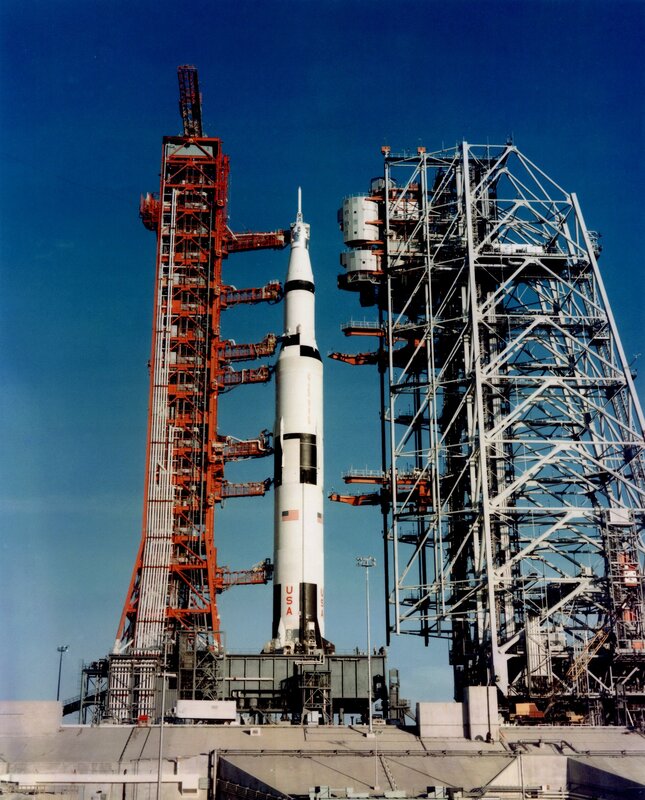 The Apollo Saturn I launchpad slide wire used single person rescue strops, for a one man ride down the wire. The Saturn V launchpad slide wire used a multi crew basket. This photo shows a combination. There is a brief mention here of maybe why that one-man slide wire escape system from the LUT was abandoned. Scroll down to the Egress System paragraph. 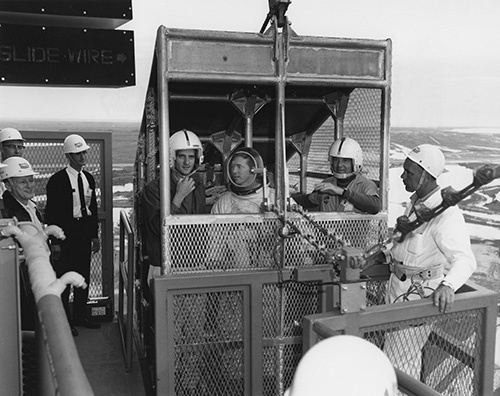 The emergency egress training for the Apollo 8 prime and backup crews included the one-man slide wire escape system at the pad 39B perimeter. An alternate emergency egress system is referred to as the “Slide Wire.” The system consists of a winch-tensioned cable extending from above the 320-foot level of the ML to a 30-foot tail tower on the ground approximately 2200 feet (horizontal projection) from the launcher. 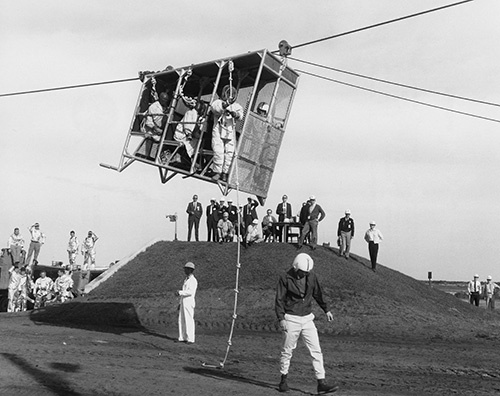 A nine-man, tubular-frame cab is suspended from the cable by two brake-equipped trolleys. The unmanned weight of the cab is 1200 pounds and it traverses the distance to the “landing area” in 40 seconds. The cab is decelerated by the increasing drag of a chain attached to a picked-up arresting cable. The occupants of the cab then take refuge in a bunker constructed adjacent to the landing area. The cable has a minimum breaking strength of 53.2 tons and is varied in tension between 18,000 and 32,000 pounds by the winch located beyond the tail tower. The lateral force exerted by the tensioned cable on the ML is negligible relative to the mass of the launcher and the rigidity of the ML tower precludes any effect on tolerances or reliability of tower mechanisms. The Saturn V launchpad slide wire used a multi crew basket. Except for Apollo 8, apparently. No crew basket can be seen at the 320-foot level in Apollo 8 photo S68-55424. Compare with Apollo 11 photo 69-H-1050. Wow! What a ride that would of have been? !